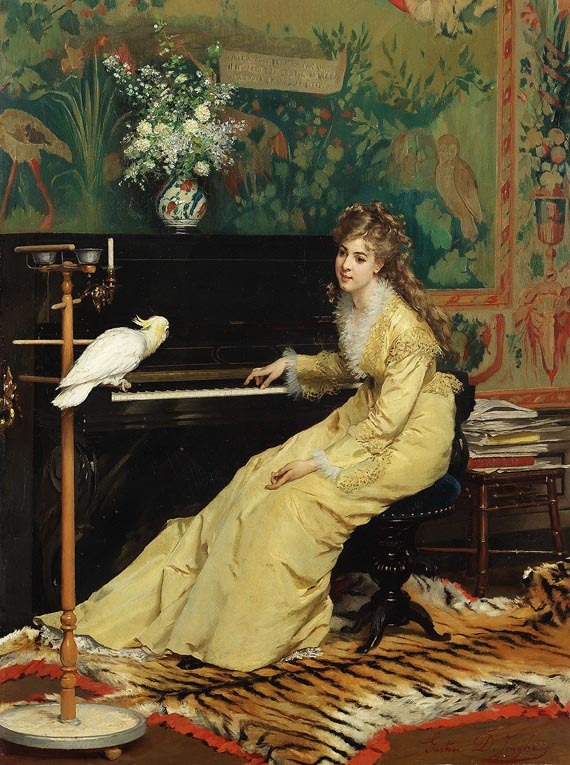 Woman at the Piano with Cockatoo by Gustave Léonard de Jonghe, (1870). 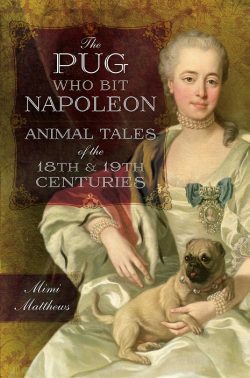 When thinking of 18th and 19th century pets, we inevitably imagine dogs or cats or small, caged canaries. Large and colorful exotic birds are not generally the type of animal we envision inhabiting the pages of a Georgian or Regency novel, much less an actual Georgian or Regency home. It may surprise you to learn that parrots were, in fact, quite popular as pets during the 18th and 19th centuries. 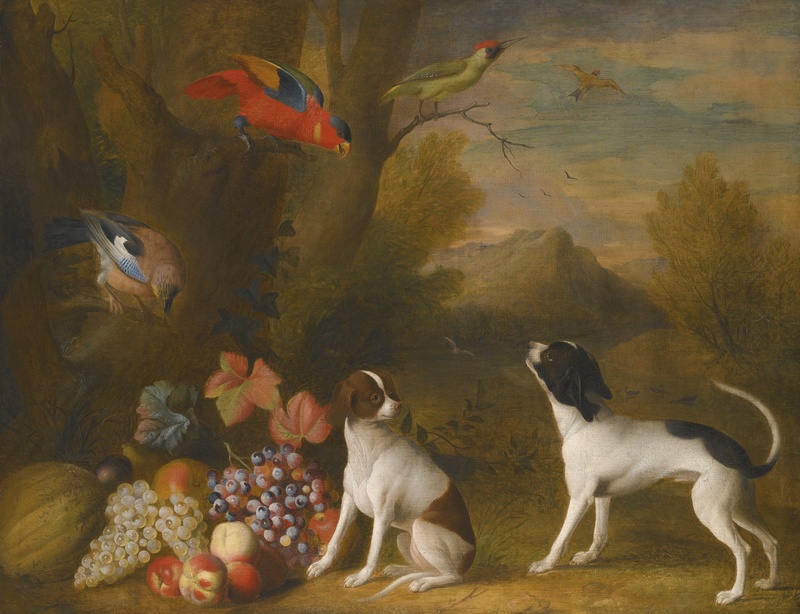 Landscape with Exotic Birds and Two Dogs by Jakob Bogdány, (1724). 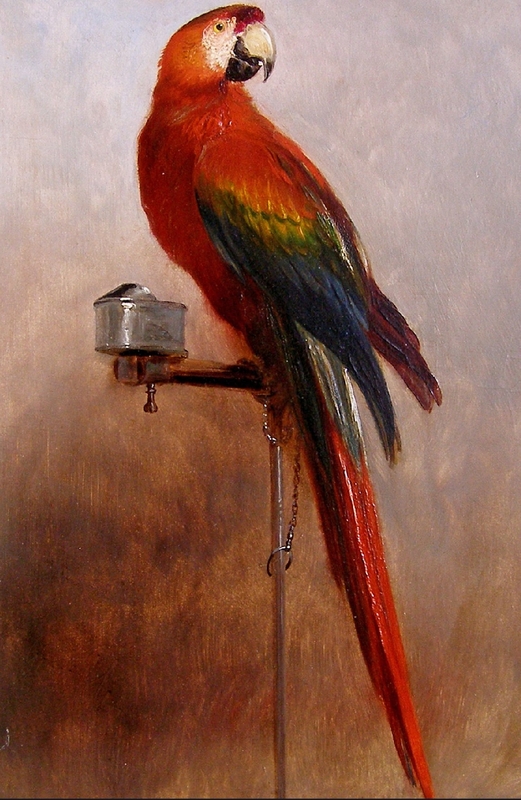 Study of a Parrot by George Cole, (1858). Parrots are mentioned as pets in many other factual accounts of the 18th and 19th centuries. One particular incident involved a court case in which two parties disputed the ownership of a pet parrot. 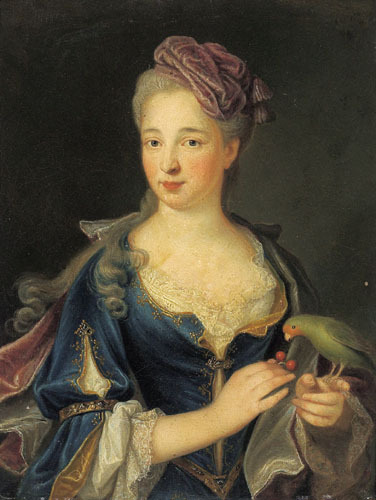 Portrait of Madame de Chateaurenard by Joseph Andre Cellony, (1730). 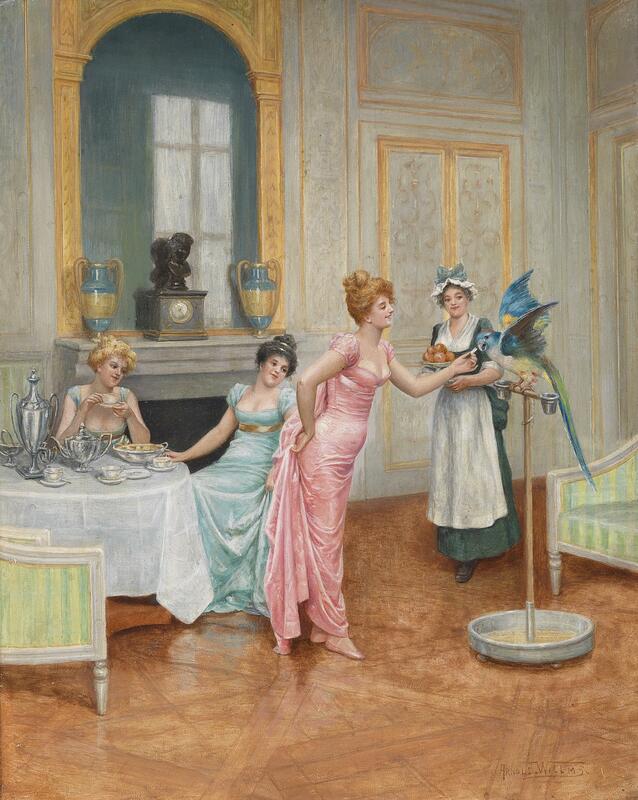 The Parrot by Arnold Willms, (1860-1900). 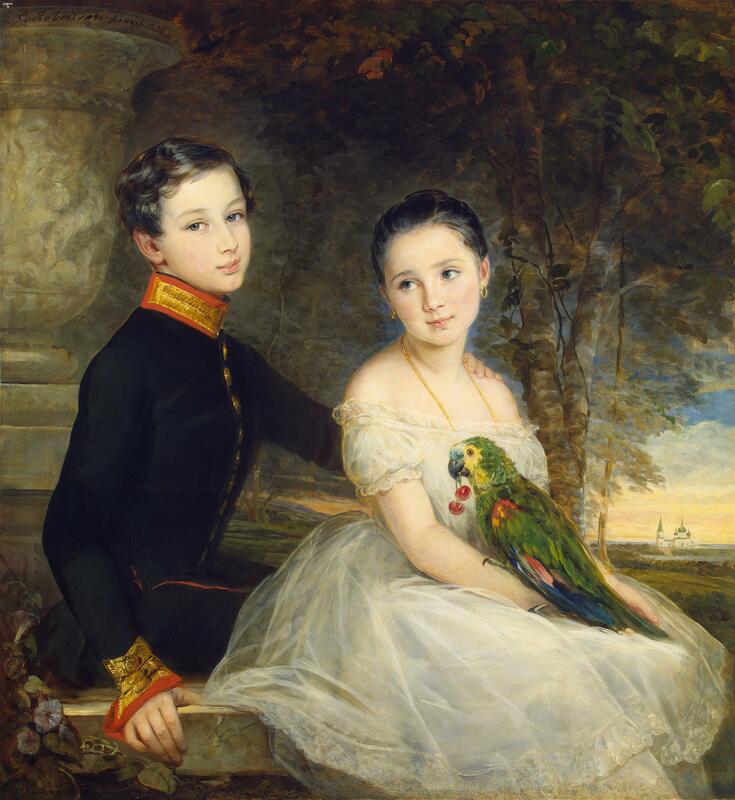 Children with Parrot by Christina Robertson, (1850). If lovely creatures always happy were. Shut up within this convent for his good. 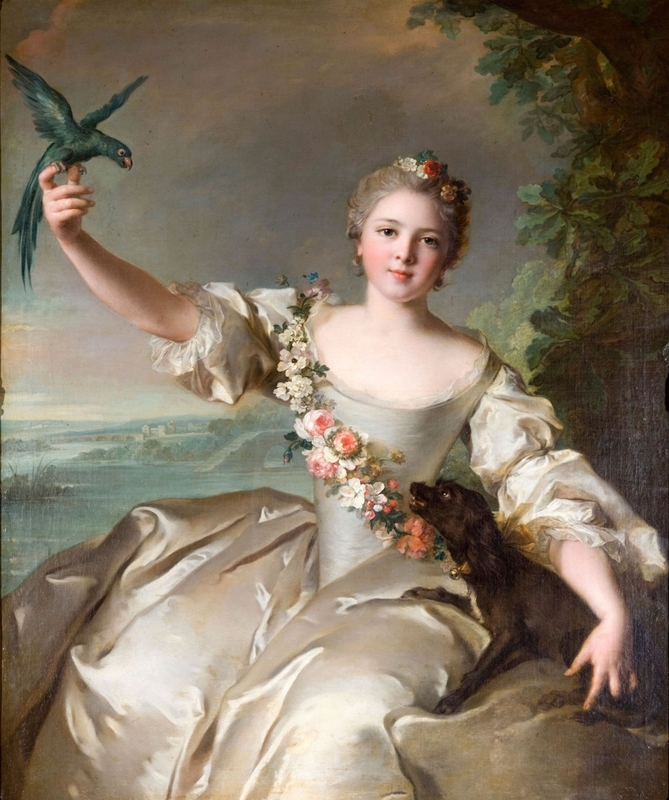 Portrait of Mathilde de Canisy, Marquise d’Antin, by Jean-Marc Nattier, (1738). If you are an author writing a story set in the 18th or 19th centuries, I hope the above examples have given you some idea of how useful parrots can be as animal characters in historical novels. Whether you prefer to use them for comic relief, a bit of extra drama, or merely as a prop in the drawing room of a particularly tonnish lady, the possibilities are endless. Gresset, Jean Baptiste. The Parrot and other poems by T. S. Allen. London: Longman, Orme, Brown, and Green, 1848. Heyer, Georgette. The Grand Sophy. Chicago: Sourcebooks, 2009. Johnstone, Christian Isobel. Clan-Albin, A National Tale. Vol. IV. Edinburgh: Longman, Hurst, Rees, Orme, & Brown, 1815. Knight, Wilson. Lord Byron. Vol. I. New York: Routledge, 2002. Littell, E. “Animal Humanity.” Littell’s Living Age. Vol. X. Jul. Aug. Sept. Boston: Waite, Peirce, & Company, 1846. Rennie, James. Natural History of Birds, Their architecture, habits, and faculties. New York: Harper Brothers, 1839. Thank you for commenting, Sarah, and for including that wonderful Rossetti poem! I love the imagery of birds in poetry. I don’t recall the exact quotes, but I know Emily Dickinson mentions birds quite a bit in her poems as well. My father, who did his national service as a merchant seaman, brought home an African Grey, which was friendly with my grandmother’s kitten, Tim-Tom. they would perch, one on each slippered foot, as she sat at breakfast, and Pol would remark, “Polly likes fruit”. Unfortunately Polly did not thrive in the cold climate and did not live many years; she had probably been sold when too young, which my father didn’t know. What a sweet story, Sarah . I hope the two remained friends when the kitten grew into a cat! Mimi, thank you so much for this beautiful piece and artwork, I thoroughly enjoyed it! I’m so glad you liked it, Vickie. Thank you for your comment! Well done, Mimi, as always! “…over and over, with might and main, it screamed the eternal sum of its political opinions, in defiance of threats and remonstrances.” Remarkable creature! So glad you enjoyed it Angelyn. I thought that piece about the parrot & his political opinions was hilarious. I can just picture it!